Editor’s note: In Philadelphia, we’re all familiar with rants about sports. So once a year, PSP’s writers take several days to just flat out rave about players. They may not be the best players, but they’re players we like. Here’s another one in our Raves series. This Rave is a guest entry into the series, written by longtime PSP reader Guido Gaeffke. You should check out the Philadelphia Unity Cup. This year, the tournament features 52 teams representing countries around the world. It’s a great event. And Philadelphia city recreation chief Bill Salvatore is the guy running it. What Bill and his team are doing for soccer in the city is just mind blowing. To organize the Philadelphia Unity Cup with more than 50 teams who play with more heart and grit than many professional teams deserves a lot of praise. It is just sad to see that not more soccer lovers are getting into it. For example, I watched the quarterfinals earlier this month on Temple’s soccer pitch while a block organized by Bill took place nearby with a great band, great food trucks, a great beer garden (with the first drink free!) and so much more. The free attendance should have been so much better. The block party and the games, especially the Irish one, was so much more fun than the sad spectacle during the previous night in Chester. Sometimes the passion boils over big time, and it is not easy for Bill and the referees to settle the players down. This just demonstrates how much desire these players have to win. The website that Bill’s staff has put together also deserves a mention. It has clear schedules and a great picture of Mayor Jim Kenney and last year’s championship team. It is also worth noting that the number of teams seems to be increasing each year. Liberia and Ivory Coast will face off in the finals at 5 p.m. on Oct. 13 at Talen Energy Stadium in Chester (which is much better than the Linc, where it was played during the previous two years). The third place game between Ireland and the United States is earlier in the day, at 1 p.m. The full schedule of events is here. 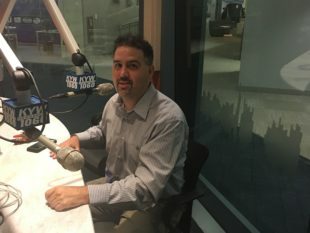 Last year’s Philly Soccer Show interview with Bill can be heard here. It’s worth listening. It’s also worth going to see the games. You’ve missed most of the games, but it’s not too late to see the finals. It’s good soccer and a good cause.